The Protestant Reformation began in Germany in 1517, and the adoption of Lutheranism was the decisive impetus for literary development in Finland. As the Reformation required the use of the vernacular in services and ecclesiastical ceremonies, new manuals and biblical translations were needed urgently. The first Finnish books were produced by Mikael Agricola. He was born an ordinary son of a farmer, but his dedication to his studies opened up the road to leading roles in the Finnish Church. He was able to bring a total of nine works in Finnish to print, which became the foundation of literary Finnish. The first chapter outlines the historical background necessary to understand the life’s work of Mikael Agricola. The second chapter describes Agricola’s life. 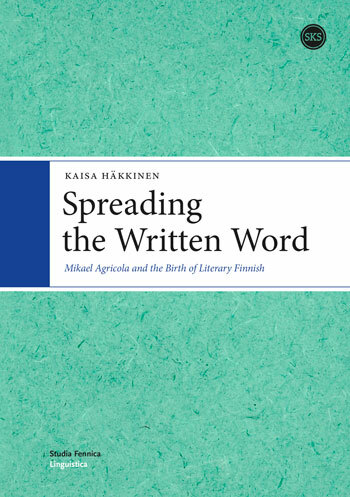 Chapter three presents the Finnish works published by Agricola. The fourth chapter is a depiction of Agricola’s Finnish. Agricola carried out his life’s work as part of a network of influential connections, which is described in chapter five. The sixth chapter examines the importance of Agricola’s work, research on Agricola and Agricola’s role in contemporary Finnish culture. The book mainly focuses on language and cultural history, but in terms of Church history, it also provides a review on the progression and arrival of the Reformation to Finland. Finnish is a Uralic language but the source languages of Agricola’s translations – Latin, German, Swedish and Greek – were all Indo-European languages. Thus, the oldest Finnish texts were strongly influenced by foreign elements and structures. Some of those features were later eliminated whereas others became essential constituents of standard Finnish. To illustrate this development, the Finnish in Agricola’s works has systematically been compared with the standard contemporary language.